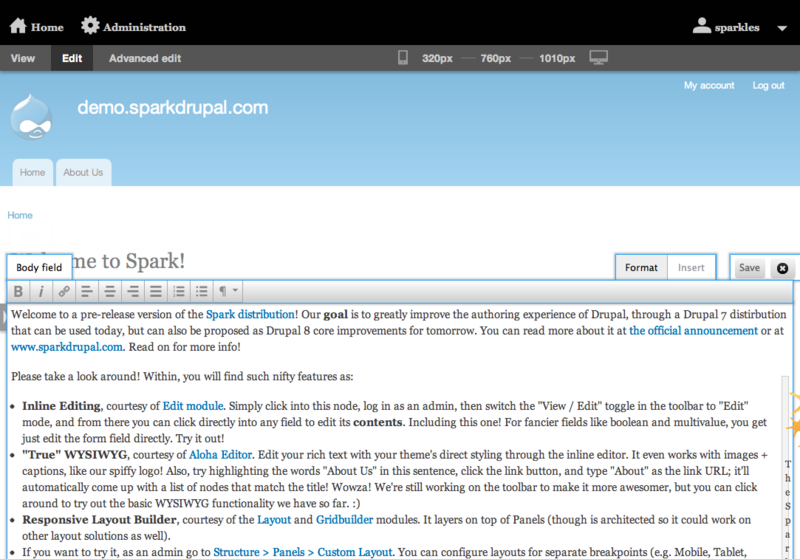 Spark Drupal is an initiative to improve the authoring experience in Drupal 7 / 8. Yesterday I spent several hours discussing the proposed improvements and am quite excited about the enhancements that the changes will make to the experience of newcomers to Drupal the product. Some notes about the above inline edit WYSIWYG UI that will be discussed in more detail in my Drupalcon Munich session Accessibility of Custom User Interface Components using WAI-ARIA. These are not buttons, using <button> or role="button" would change the semantics in the DOM / accessibility API respectively. This is not a tablist nor are these tab buttons. See http://www.w3.org/TR/wai-aria/roles#tablist for the roles related to tabs. Hiding the unused tab does remove it from the Accessibility API so it is not accessible to assistive technology. This is good as UI / API should be in sync. Using the button element conveys proper semantics to the DOM and accessibility API. There has been recent discussion on the WebAIM mailing list about how to identify an active / selected item. Does it conform to WCAG, is it technically accessible, and can users understand and operate a UI are three different questions. 3. It is not intuitive to understand that activating one of the links toggles something else on the page, and no notification of the result of the action is communicated.